"FRUITFUL HARVEST BY OBEDIENCE, KNOWLEDGE, EXCELLENCE AND THE SUPERNATURAL"
BOOK FOR THE MONTH - The Gospel According To Luke - Read a chapter a day of the book of Luke. We will finish it at the end of this month. The literature for the month is SENIOR PASTORS'S book entitled "GOLIATH CAN FALL". Please finish reading this book during this month. It is virtuous, invigorating and biblical to set aside time each year to honor the Pastor of the church and his family. It can be one of the most enjoyable and unifying times a congregation will experience. But it is also imperative that appreciation of the Pastor not be confined to just one week or one month. It needs to occur throughout the entire year. In fact, it needs to be present throughout the entire ministry of the Pastor with the church. 1. Allow time off for relaxation and restoration. All pastors need time away with their families, as well as time alone with God. Give your pastor at least one or two days off each week, and respect his or her privacy during those days. Set boundaries and make sure all members of the congregation respect them. leadership rather than presenting constant opposition. Allow and expect him to speak out honestly against sin and injustice. Let the Holy Spirit work. 3. Be willing to participate enthusiastically in shared ministry. The most exhilarating moment a pastor can experience is to have a layperson say, “Pastor, I really want to make a difference in my world for Christ. I want to put on the whole armor of God and enter the fray. Will you help me? Will you train me? Will you pray for me?” Join your pastor in God’s ministry. 4. Support your pastor with regular prayer, love and encouragement. These are the most important things a church member can provide for a pastor. Prayer empowers pastors to be the people God called them to be. It is difficult to pray for someone and be critical at the same time. Love your pastor as Jesus loves them, and show it through regular, tangible acts of encouragement (such as simple cards or notes) all year long. 5. Create an atmosphere that minimizes ministry stress and unrealistic expectations. Cherish your pastor’s Christ-like character as a priceless asset for your church. Avoid grumbling, poisonous humor or a negative spirit. Be loyal. Come alongside him to facilitate personal renewal and restoration. Keep him accountable in avoiding an excessive schedule and maintaining healthy priorities. 6. Care for your pastor’s family. Don’t expect pastoral families to be any more perfect than your own. Recognize that every family is unique and eliminate unrealistic expectations. Encourage your pastor to make family a priority (even above ministry to you) and to give it the time, energy and effort required to keep it healthy. Recognize the tremendous sacrifices he makes on your behalf and offer massive affection and affirmation. Provide for their comfort, needs and preferences. Don’t cut corners. KINGSLIGHT CHAPEL, ARISE! START NOW! 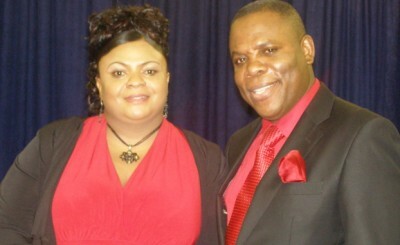 EXPRESS YOUR APPRECIATION FOR THE FIRST FAMILY OF THIS CHURCH- GOD WILL BLESS YOU AS YOU OBEY HIM. Did you know that you carry a lethal weapon with you wherever you go? And it would be impossible for anyone to make you check it at the door, because it is attached to your body. The Spirit of God led Solomon to write, “Death and life are in the power of the tongue” (Proverbs 18:21). That is an amazing statement! And truer than we care to think. James said the tongue is full of deadly poison (James 3:8). A frightening thought! Most of us who know the Lord want our conversations to honor Him. We want our communication habits to promote love and unity in the Body of Christ. But too often we use our built-in weapons system to accomplish the very opposite effect. Then we wonder why there is so much conflict among God’s people. A study of Scripture may help us find the antidote for the poison of gossip. The Cause for Gossip: While the word is not prominent in Scripture, the idea of gossip is sprinkled throughout the Bible. It mentions talebearers, people who whisper derogatory information about others. It mentions backbiters, people who talk about faults of others behind their backs. It mentions slanderers, people who speak against others, often with a desire to do them harm. It talks about speaking evil of people or maligning them. We can sum it all up with one word, gossip. It is an ugly word. You can even hear it hissing at you when you say it. It is so ugly, hardly anyone will ever admit to doing it. They have valid concerns. They want to share a matter for prayer. But they never gossip! “Being filled with all unrighteousness, wickedness, greed, malice; full of envy, murder, strife, deceit, malice; they are gossips, slanderers, haters of God, insolent, arrogant, boastful, inventors of evil, disobedient to parents, without understanding, untrustworthy, unloving, unmerciful” (Romans 1:29,30). Yet gossip seems to be another one of the Christian’s favorite pastimes. Why? The Cure for Gossip: Ask the Lord to help you guard your tongue. The psalmist did. “Let the words of my mouth and the meditation of my heart be acceptable in Thy sight, O LORD, my rock and my Redeemer” (Psalm 19:14). “Set a guard, O LORD, over my mouth; Keep watch over the door of my lips” (Psalm 141:3). God loves to help people who humbly admit their need and ask Him for help. Will you try it? He will help you conquer the gossip habit. Most of us want others to think well of us. If we were honest, we would admit that a good bit of our thought-life is occupied with our acceptance level: “Do they know who I am? Do they like me? Do they respect me? Do they think I know what I’m talking about? Do they think I’m attractive? Do they like what I’m wearing? Do they want to be with me?” The lower our self-esteem is, the more we worry about things like that, but all of us give some thought to them. And that is why we gossip. We want to make ourselves look better and gain greater acceptance. If we have confidential information others do not have, it makes us appear important, knowledgeable and superior. People will listen to us. If we fear somebody else excels us in some way, cutting them down helps us excuse our failure to achieve what they have achieved. If we are jealous of the attention or acclaim they get, pointing out their faults makes us look a little better by comparison. If somebody has injured us, putting them in a bad light seems to us to be a fair way of retaliating, balancing the scales and restoring some of our self-esteem. It can also be an effective way of winning people to our side in the conflict. We seem to think that having more people on our side gives us greater worth. It would help us more though, if we realized that God loves us as we are, that He has accepted us in Christ and considers us a valuable part of His team with a significant role to fill. We don’t need to put others in bad light to establish our own importance. There are other reasons we gossip. For one thing, we may have had a poor example. We grew up hearing our parents gossip and so were led to believe it was an acceptable part of life. Another possibility is that we have not developed our minds to the extent that we have anything else to talk about but people. Somebody has suggested that folks with great minds talk about ideas, folks with average minds talk about events, and folks with small minds talk about other people. It would help to develop our minds. The Apostle Paul suggested that we may gossip because we do not have anything better to do. He talks about young widows who “learn to be idle, as they go around from house to house; and not merely idle, but also gossips and busybodies, talking about things not proper to mention” (1 Timothy 5:13). Gossip here is foolish talk, especially talk that incriminates others. Their gossip is tied both to their idleness and to their tendency to be busybodies, that is, meddling in the affairs of other people. If they invested their time and energies into spiritually profitable activities such as visiting rest homes, ministering to shut-ins or caring for children, they would not have time to chatter about other people. But the cause for gossip is not nearly as important as the damage it does. In the Levitical law given by God to Israel, they were told not to be talebearers. Leviticus 19:16. You shall not go about as a talebearer among your people; nor shall you take a stand against the life of your neighbor: I am the LORD. God clearly warns us to not take part in this kind of behavior. Solomon refers to a person bearing false witness as three types of weapons. Proverbs 25:18 (NKJV) a man who bears false witness against his neighbor is like a club, a sword, and a sharp arrow. Words can be as deadly as weapons: Solomon compares deceitful words to three different weapons. A maul (battle-ax) that crushes at close range; a sword that cuts; an arrow that pierces and can be shot from a distance. This behavior is very harmful. Proverbs 17:9 says that “he who repeats a matter separates friends.” It separates friends because of the pain it causes as well as the conflict caused by it. It is compared to wood and fuel to a fire. Proverbs 26:20 (NKJV) where there is no wood, the fire goes out; and where there is no talebearer, strife ceases. The book of Proverbs is like a textbook on the tongue, and it mentions several damaging effects of gossip. The first is that it separates friends. “A perverse man spreads strife, and a slanderer separates intimate friends” (Proverbs 16:28). “He who covers a transgression seeks love, but he who repeats a matter separates intimate friends” (Proverbs 17:9). Sometimes gossip is done purposely and maliciously by a jealous person who resents the friends someone else has. If he can dig up any trace of disreputable information, he will use it to drive a wedge between friends so he can try to move into the gap. He finds that to be easier than winning friends by showing genuine, unselfish kindness to others. “I don’t mean to be talking about her, but …” “I don’t want you to think I’m gossiping, but …” And in goes the knife! On the other hand, there may be no malicious intent. It is just idle talk, or an effort to appear on the “inside.” But the result is just the same. You may have heard about the conversation where Ellen says, “Suzie told me you told her the secret that I told you not to tell her.” Jane answers, “Why that blabber mouth! I told her not to tell you I told her.” So Ellen replies, “Well, I told her I wouldn’t tell you she told me, so don’t tell her I did.” That friendship is doomed. Friends have to be able to trust each other. “He who goes about as a talebearer reveals secrets, but he who is trustworthy conceals a matter” (Proverbs 11:13). Another consequence of gossip is that it wounds people. “The words of a whisperer are like dainty morsels, and they go down into the innermost parts of the body” (Proverbs 18:8). How do you feel when you find out that people have been talking about you unfavorably? They may have enjoyed it as one would enjoy a dainty morsel, but it hurts you, doesn’t it? And the hurt reaches down to your innermost being. While we know the Lord wants us to forgive them, we usually stew on it, worry over it, fret about it, feel sorry for ourselves and get angry with them. Sometimes it begins to affect our ability to function properly. And it may take a long time to heal. Think about that the next time you are tempted to share some juicy tidbit about someone. Would you want that told about you, even if it were true? Gossip not only wounds, but it also destroys. I have a pastor friend, in his late sixties, who put his arm innocently on the shoulder of a single female missionary who had just returned from the field. A few old biddies in the church saw him and nearly ended his ministry. Another gracious, godly and extremely capable pastor in my acquaintance was forced to resign his pastorate because an associate began to sow seeds of suspicion and doubt about his abilities, even making insinuations about his sanity. Ministers have been destroyed by other men in the ministry who thought they knew what their colleagues believed, but misrepresented it publicly and attacked them personally. How that must grieve the heart of God! Gossip likewise instigates anger. “The north wind brings forth rain, and a backbiting tongue, an angry countenance” (Proverbs 25:23). Some of the angriest people I have ever talked to have been the victims of vicious gossip. They were furious. The resentment they have built up as a result of the anger is sin, and they need to resolve it. But the person with the runaway tongue will still answer for his disobedience to God’s Word. That leads to the final consequence of gossip we want to mention. It causes contention and strife. “For lack of wood the fire goes out, and where there is no whisperer, contention quiets down” (Proverbs 26:20). We all have known of churches which were wracked with strife. But there never has been one where the strife would not disappear if people would stop gossiping. “Do you know what he said? Do you know what she did? I’ll tell you what I think he’s after. If he would just do his job, everything would be all right. Do you know what that board is up to now?” Blah, blah, blah! Foolish talk. But it is like wood on the fire. It gets other people stirred up, and they get other people stirred up, and what started out as a spark turns into a raging fire. James tells us where the original spark comes from. He said it “is set on fire by hell” (James 3:6). And Satan must be laughing himself silly over it. Gossip is his game. The name devil means “slanderer.” And he is called “the accuser of our brethren” (Revelation 12:10). But God hates it. He says the person who spreads strife among brothers is an abomination to Him (Proverbs 6:16-19). Well, what are we going to do about it? There is a great warfare going on. It is a fierce battle incomparable to any of the historical wars that humanity has ever experienced. It is a spiritual war without cease fire and no truce given. It is a war between light and darkness, between the Kingdom of God and the Satanic Kingdom. The outcome of this battle has far reaching consequences on nations individuals, families, and churches. The outcome is so critical to the future hence making the battle a crucial one. One important aspect of this battle is that it is an individual battle fought at the personal level between the individual Christian or local church and the gates of hell. It is therefore the individual’s responsibility to ensure victory making use of God’s provision. The word “Wrestle” implies a hand-to-hand and foot-to-foot struggle for the mastery: To wrestle successfully with Satan, we must wrestle with God in irresistible prayer like Jacob (Gen 32:24-29; Hosea 12:4). To wrestle is to throw, to swing, a contest between two till one hurls the other down and holds him down. This is the exact picture of the combat we are involved in. The day one gets born again is also the day one gets enrolled in this fearsome duel. It is a face to face conflict to the finish. It is important to note that it is not with flesh and blood that we have to fight, as was the case with Israel. Our blessings are spiritual in the heavenly places. We are sitting in Christ in the heavenlies. We are a testimony to principalities and powers in the heavenlies; we have to wrestle with spiritual wickedness in the heavenlies. Israel had passed through the wilderness –had crossed the Jordan; the manna had ceased; they ate the corn of the land. They were settled in the land of Canaan as though it were all their own without striking a blow. They ate the produce of this good land in the plains of Jericho. So it is with regard to the Christian. Although we are in the wilderness, we are also in the heavenly places in Christ. We have crossed the Jordan, we have died and are risen again with Him. We are sitting in the heavenly places in Him, that we may enjoy the things of heaven as the fruit of our own country. But conflict is before us, if we desire to enjoy them practically. The promise is of every blessing, of all the Promised Land, but wheresoever we shall set our foot on it (Joshua 1). For this we need the Lord’s strength, and of this the apostle now speaks. ”Be strong,” he says, ”in the Lord.” The enemy is subtle. We have to withstand his stratagems even more than his power. Neither the strength nor even the wisdom of man can do anything here. We must be armed with the panoply, that is, the whole armour, of God. In the shop of a blacksmith, there are three types of tools.There are tools on the junk pile: outdated, broken, dull and rusty.... There are tools on the anvil: melted down, molten hot, moldable and changeable.... There are tools of usefulness: sharpened, primed, defined, and mobile. They lie ready in the blacksmith's tool chest, available to their master, fulfilling their calling.... We are all somewhere in the blacksmith's shop. We are either on the scrap pile, on the anvil, in the Master's hands, or in the tool chest. (Some of us have been in all three.) .... From the shelves to the workbench; from the water to the fire....I'm sure that somewhere you'll see yourself....The rubbish pile of broken tools, the anvil of recasting, the hands of the Master--it's a simultaneously joyful and painful voyage. And for you who will make the journey -- will leave the heap and enter the fire, dare to be pounded on God's anvil, and doggedly seek to discover your own purpose -- take courage, for you await the privilege of being called "God's chosen instruments." The practice of godliness involves the pursuit of holiness because God has said, "Be holy, because I am holy" (1 Peter 1:16). Paul tells us that we have been called to a holy life; we have been redeemed for that purpose. Any Christian who is not earnestly pursuing holiness in every aspect of his life is flying in the face of God's purpose in saving him. What is holiness? The best practical definition that I have heard is simply "without sin."..... John said he wrote his first letter so that his readers would not sin (1 John 2:1). Most Christians seem content not to sin very much, but John's goal was that we not sin at all. Every sin, no matter how small it may seem to us, is an affront to God's authority, a disregard for his law, a spurning of his love. Because of this, sin cannot be tolerated in any form, to any degree.... When Paul was instructing the Ephesians' Christians about the importance of holiness he said, "So I tell you this, and insist on it in the Lord, that you must no longer live as the Gentiles do" (4:17). He insisted on holiness, and he did so with the Lord's authority. Holiness is not an option but a must for every Christian.... If we want to train ourselves to be godly, there must be holiness in every area of our lives. Honored vessels are cleansed vessels (2:20-21). Paul gave three descriptions of how to find cleansing: flee lusts (2:22); refuse arguments or speculations (2:23); and be patient and gentle (2:24-26). These attributes describe a useful vessel (2:21) and one that will keep the gospel, not self-interest, in mind (2:10). What kind of vessels are meet for the Master's use?--Empty vessels. When we empty the soul of our every defilement, we are ready for use.The treasure of the gospel is in earthen vessels, and it is God's power alone that can make them vessels of honor. Today you are to have your vessel purified, that it may be ready for heavenly dew, ready for the showers of the latter rain; for the latter rain will come, and the blessing of God will fill every soul that is purified from defilement. It is our work today to yield our souls to Christ, that we may be fitted for the time of refreshing from the presence of the Lord--fitted for the baptism of the Holy Spirit. . . The choices you and I make each day either tarnishes us or polishes us to higher degree of purity and usefulness. God has spoken to man and has revealed basic truths about life. This revelation is quite different than what man’s unaided reason feels is the explanation of secrets of living. This revelation centers in Jesus Christ. If we accept the revelation and act on these truths, (that is what faith is, accepting and acting on them), reason then will find its proper place in life and will make sense as God intended it to do. But without Faith we only struggle on in a confused cycle of bewilderment, boredom and frustration. Therefore life of Faith begins by an acceptance of Jesus Christ. Faith as we already know is a desire for something better. It starts with hope. Then becomes an awareness of Someone else in life; an Unseen Someone, who is nevertheless very real. Faith involves an assurance consequential that obedience to that Someone will bring us to the something better. Faith, therefore, is a very practical thing, is it not? We read in Hebrews Chapter 11 of men and women with like passions as ourselves living in the kind of a world in which we live confronted with the same kind of problems, who mastered their problems and overcame the obstacles and won their way to a tremendous fulfillment by faith. You can test your own faith as you read this chapter which is self explanatory by carefully looking at distinguishing marks of genuine faith displayed by these outstanding characters. Perhaps the most characteristic thing is that faith always anticipates i.e. it moves towards a clearly expected event in the future. Faith believes that God has revealed something about the future; not everything, but something. And what he has revealed is quite enough for us to know. Faith seizes upon a revealed event and begins to live in anticipation of it. Therefore, faith gives life goal, purpose and destination. It is a look into the future. That is rather unusual. Here is a man who left home and went abroad without making any reservations. He went out on a journey without a map, leaving his friends and his influence behind. There must have been many who said to him, "What an absurd thing to do, to go out not knowing where you are going. What is your destination?" And Abraham said, "I don't know." He did not know where he was going, but he knew whom he was going with, and what a difference that makes. Because he obeyed, the land became his and his children's. Even to this 20th century hour we have ample evidence in the existence of the nation Israel in that self-same land that the promise God made to Abraham is valid, forty centuries later. But perhaps the most striking quality of all is that faith dares. When God has spoken, faith ignores the contrary evidence even though it seems to be absolutely impossible. There is a prophetic word of God on your life declaring the King’s agenda for your future, but the peculiarities of a person can pose a great challenge to the realization of that dream or achievement. Some peculiar behavioral tendencies are directly in opposition to God’s word concerning your life. Moses had a peculiarity; he was not eloquent yet God used him and took care of that stone by appointing an eloquent person to assist him. Just like Moses there is always a desperate attempt by the enemy (Satan) to keep you from fulfilling your destiny. The fulfillment of God’s prophetic agenda threatens the Kingdom of darkness, because it will elevate you. It will also bring great benefit to the rest of humanity and therefore causing havoc to the wicked intentions of the devil. You are a target of the enemy and it will continue to be so until every good thing in you is stilled by the machinations of the devil. Every frustration to deter you from achieving your purpose will be released by the gates of hell and human enemies. Know that no peculiar impediment is capable of preventing your rise to destiny, because like Moses his speech did not prevent the fulfillment of his destiny. You are the only one who can prevent yourself from achieving your maximum because God always keeps his side of the promise.
" I have set watchmen upon thy walls, O Jerusalem, whichshall never hold their peace day nor night: ye that make mention of the LORD, keep not silence, And give him no rest, till he establish, and till he make Jerusalem a praise in the earth. But they that have gathered it shall eat it, and praise the LORD; and they that have brought it together shall drink it in the courts of my holiness." "A good man's prayers will from the deepest dungeon climb heaven's height and bring a blessing down"
PRAYER unites with the purposes of God and lays itself out to secure those purposes. How often would the wise and benign will of God fail in its rich and beneficent ends by the sins of the people if prayer had not come in to arrest wrath and make the promise sure! Israel as a nation would have met their just destruction and their just fate after their apostasy with the golden calf had it not been for the interposition and unfainting importunity of Moses' forty days' and forty nights' praying! No mission was more majestic in purpose and results than that of Moses, and none was more responsible, diligent and difficult. In it we are taught the sublime ministry and rule of prayer. Not only is it the medium of supply and support, but it is a compassionate agency through which the pitying long-suffering of God has an outflow. Prayer is a medium to restrain God's wrath that mercy might rejoice against judgment. Prayer influences God greatly. Moses cannot do God's great work, though God-commissioned, without praying much. Moses cannot govern God's people and carry out the divine plans, without having his censer filled full of the incense of prayer. The work of God cannot be done without the fire and fragrance are always burning, ascending and perfuming.